Albert Louis Garza II was born in 1971 to Silvana Dolores Salamone (Jewish Italian) and Albert Louis Garza Sr. in San Gabriel California. Albert Louis Garza II learned martial arts from his father Al Garza, creator of the Matrix System. Al Garza II holds black belts in Lima Lama, by his father, and Brazilian Jiu-Jitsu under Pedro Carvalho. He began his training at the age of 5 with his father and continued his training with world champions such as Gene LeBell, Pedro Carvalho and Cleber Luciano who he competed against in his first Brazilian Jiu Jitsu black belt tournament. Al Garza is a world champion in MMA and Martial Arts holding numerous titles. Al Garza's MMA record from 1995 to 2006 ended with 15-2-0. He is a former certified Defensive Tactics Instructor for the Correctional Academy at SJVC Hesperia Campus. YouTube link. Dr. Garza is an independent research scholar. Al Garza's education includes a PhD in Biblical Studies from the DOD University's NAHED vendor graduate program. He also completed Bar-Ilan University's Biblical Archaeology certification program and the Master's Biblical Linguistic Associate Scholar Program from Hebrew University's Institute of Biblical Studies, Jerusalem (see pic above). Which included the study of Biblical Hebrew, Aramaic and Greek. Dr.Garza has authored over 20 books such as "Calvinism Challenged", "The Doctrines of God", "Grace", "YH?H: The Name of God, Hidden and Revealed", "My Presence, THEY Will Go", "The First Satan", "The Ancient Jewish CROSS", "Yeshua? ", "The Hebrew New Testament" and "The Jewish Unveiling Of Revelation And The End" who's contributing author was Kenneth Gentry Jr Th.D. He is currently working on a New Testament 8 volume series, "A Rabbinic Jewish Source Commentary and Language Study Bible". Matthew , John , Epistles and Paul volume 6a and 6b are currently available on Amazon.com, Barnes and Noble and online bookstores. Dr.Al Garza was the Religious Educating Coordinator holding both Federal and Government contracts for the DOD. He is the founder and director of The Hebrew Institute and has been a student of the Bible for 30+ years and is the owner of three companies including a non-profit corporation, "YHVH" ministry. Dr.Al Garza is currently in California where he now lives with his family and teaches at Victor Valley College and Victor Valley Christian Church in Hesperia. 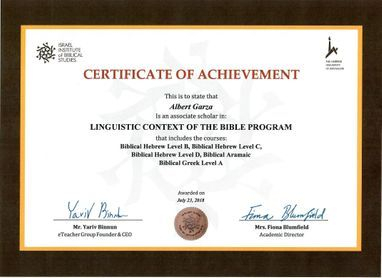 Biblical Hebrew, Modern Hebrew, morphology, lexicology, lexicography, onomastics, sociolinguistics and his current main research is the lexicography of Ancient Hebrew.